Stir in plenty of food, snowy hikes, and our annual Bros’ Bowl tournament and there went the weekend. But back to the Mercedes. Sports cars and exotics are great for impressing your friends and amusing yourself (as I demonstrated with three luxury convertibles in January 2012), but the ideal winter vehicle is a full-size, all-wheel-drive crossover or SUV. Winter tires are highly desirable. So is a third row of seats, which, in the case of my wintry guys’ weekend, is best utilized when folded flat and buried in cases of beer, casseroles, coolers, skis, boots, heavy jackets, and whatever other sundries we’ve deemed essential. 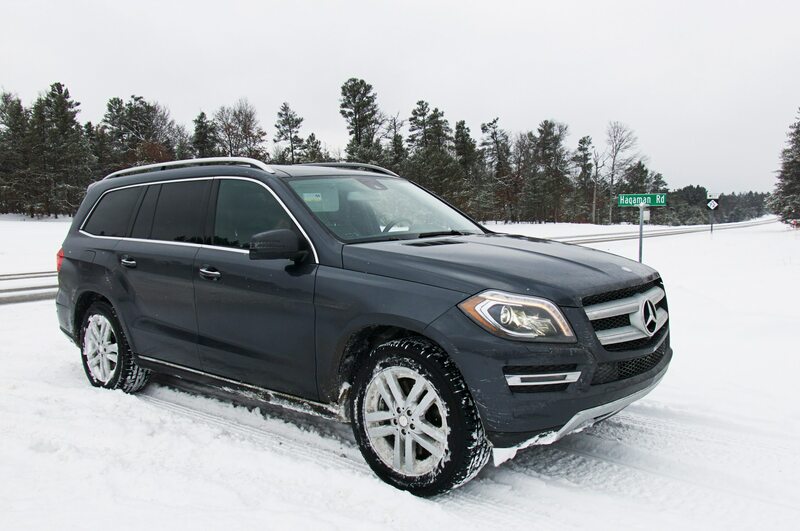 Our Four Seasons Mercedes-Benz GL450, fitted with Pirelli Scorpion winter tires, fit the bill to a T (as have former Four Seasons haulers such as the 2007 GMC Acadia, the 2011 Infiniti QX56, and the 2013 Infiniti JX35). Mercedes-Benzes are pretty special to most Midwesterners, and my friends looked forward to the chance to ride in one for a few hours. Once ensconced in the GL, though, they were relieved when they were told that this is perhaps the least luxurious Benz extant—no one wants to have an idol deflated, especially while on vacation. Being unfamiliar with Mercedes products, a couple of my friends needed help finding the power controls for the passenger’s seat (located high and forward on the door). Some of the Luddites even closed the power-operated rear hatch by hand! How quaint. 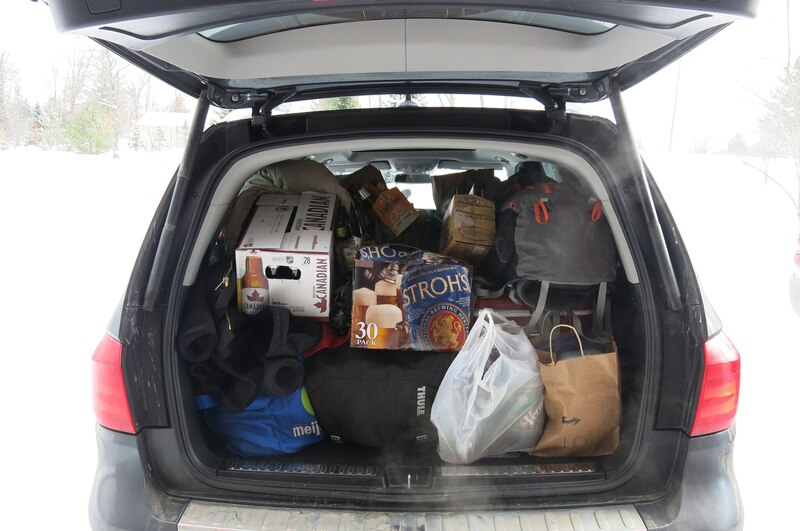 On the three-hour trek from Lansing toward minuscule Comins, Michigan, only two friends joined me in the GL, but we managed to fill the big SUV with stuff. Folding down half of the middle row helped preserve rearward visibility. Other northbound observations: The SUV’s extreme curb weight (5550 pounds) is often wallowingly apparent to all occupants. Mediocre ride quality and occasional bounciness disappointed. The navigation system understood our voice commands very well. Abundant glass surrounding the spacious cabin enhanced our moods. We needed all of the Lake Superior–like washer-fluid reservoir. In automatic mode, the climate control doesn’t want to blow very hard toward the floor. Underground Garage is an excellent SiriusXM station for background tunes. We parked the GL450 in the garage of our rented “Log Castle” at about 1:30 p.m. on a Friday and didn’t start the truck again until midday Sunday, electing instead to, ahem, drink 201 beers in the interim, with the help of another seven friends who joined us from as far away as San Diego and Omaha. Stir in plenty of good food, a few hockey games on TV, snowy midnight hikes, and—most prominently—the second-annual installment of the Bros’ Bowl tournament (five events: euchre, poker, BB-gun/beer-can biathlon, blind taste-testing of brewskis, and Hammerschlagen) and there went the weekend. It’s immense fun—even if you’re terrible at hitting nails with the sharp end of a cross-peen hammer while bundled like the Michelin Man (not to mention being well-lubricated) on a sunny, subfreezing afternoon. The GL had one more passenger for the trip south on Sunday, which meant that our luggage almost reached the roof in the cargo space behind the upright middle row and atop the still-folded back bench. 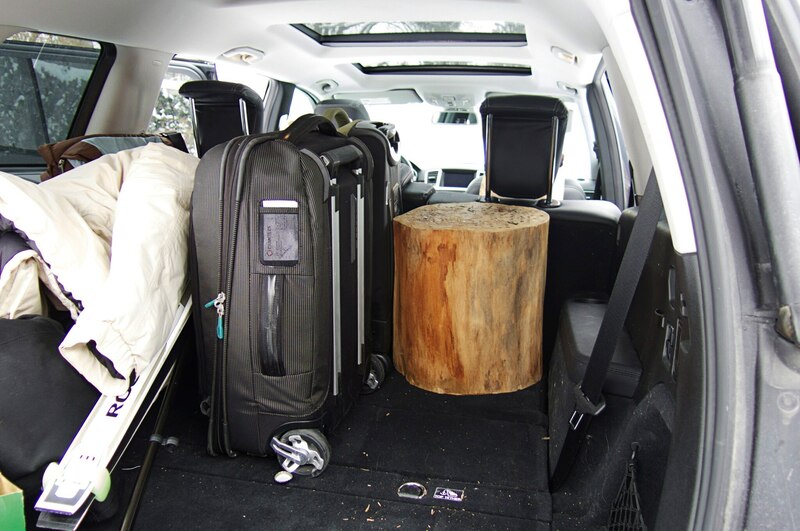 Had I driven the sportier, more distinctive Four Seasons Acura MDX (my first choice), we probably would’ve had to throw away some of our recyclable, returnable empty cans and bottles. That’s probably the only time a Mercedes GL has been accused of helping save the planet. 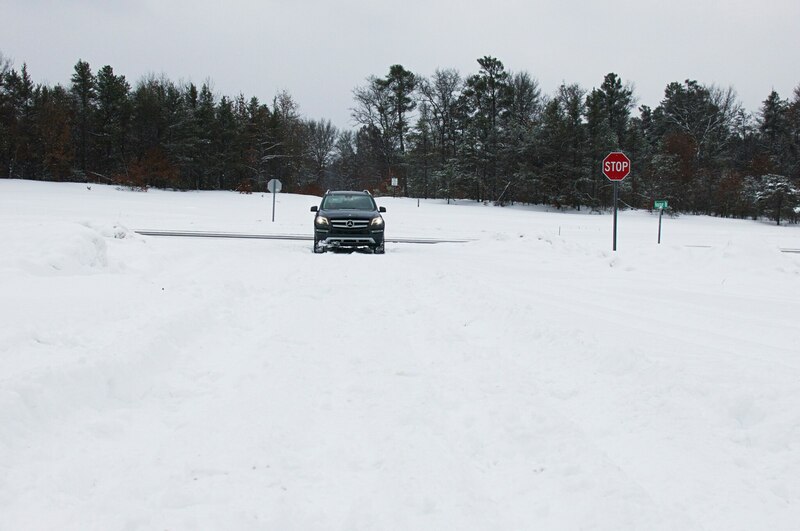 This winter, as many of you well know, has been particularly harsh, so I should have known better than to turn onto a “Seasonal Road” (not plowed by the county) off of M-72 about thirty minutes into our trip homeward. I pulled off to take a photo at a very rural intersection and planned to execute a three-point turn to get pointed back toward the main road. 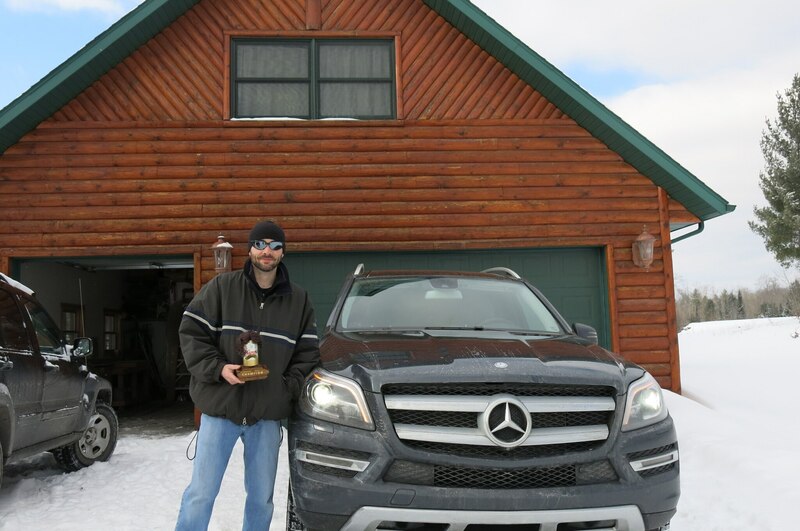 The portly GL quickly bogged down and sank in several inches of soft snow, and the Benz’s dainty electronic shifter hindered this driver’s efforts to rock it free. My bewildered cohorts soon joined me outside the GL. Those of us whose gloves weren’t packed away swept the mounds of snow from behind the tires, and my three buddies positioned themselves at the hood so they could help push the Mercedes backward toward the paved, cleared road. 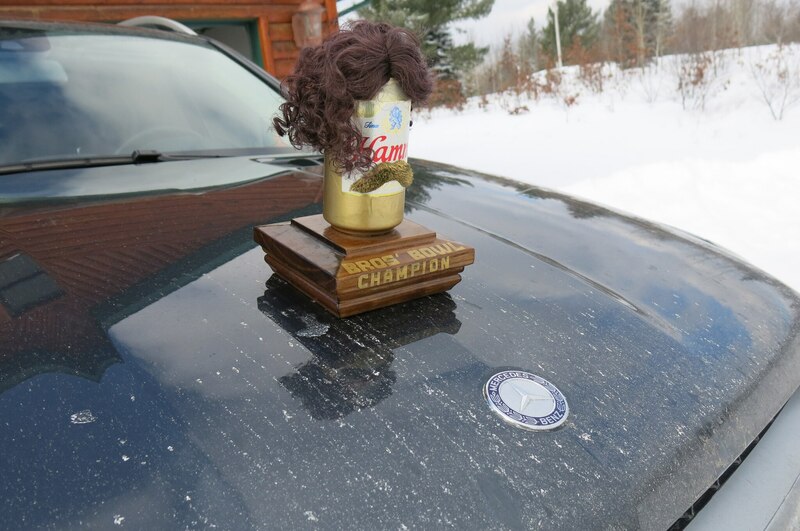 Fortunately for my pride and our afternoon plans, this worked effectively on the first try and didn’t require too much exertion on the part of my buddies or the truck. I even snapped a few photos. So you see, even though giant luxury SUVs are usually overkill, sometimes people— even faux Olympians—really do need them.